Coming off the team’s best result of the 2014 season, SRT® Motorsports visits Canadian Tire Motorsports Park with bolstered confidence and strangely symmetrical results for the SportsCar Grand Prix on Sunday, July 13. In the IMSA TUDOR United SportsCar Championship’s last race, the six-hour endurance contest at New York’s Watkins Glen International, the No. 91 Dodge Viper SRT GTS-R claimed second, while the No. 93 took home third – a result that identically matched the team’s finish at Canadian Tire Motorsports Park (Mosport) in July of 2013. 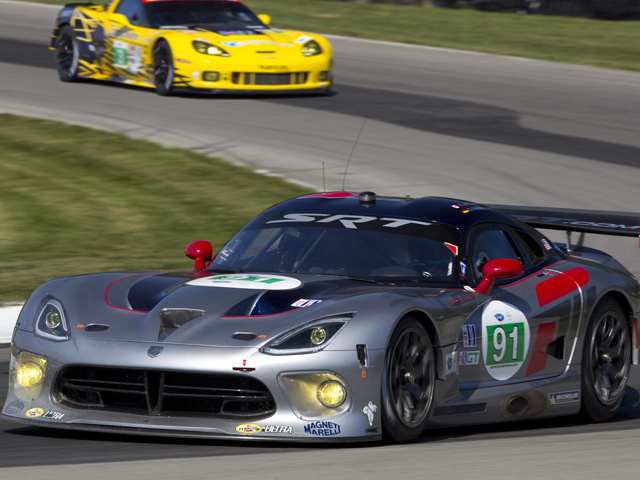 The Watkins Glen result was the team’s second dual podium and the combined results marked the Viper’s best finish in 2014. After tallying four podium finishes in three endurance races in 2014, SRT Motorsports is aiming for a strong showing in the sprint format at Mosport, a track where the team had familiar success in 2013. The 2013 Mosport finish was the team’s first double podium and Jonathan Bomarito started the race from the pole after a track record qualifying lap for the GT class (1:15.462). The SRT Motorsports team surged following the Mosport success and went on to win the following race at Wisconsin’s Road America from the pole, marking the team’s first victory, and tallied four top-fives over three events. In both years, the SRT Motorsports dual podium has come in the fifth event of the season. Knowing that, the Viper team is hopeful another summer surge – and perhaps a win – is coming. The SportsCar Grand Prix, the sixth event for the GTLM class in the 2014 IMSA schedule, will be broadcast live from Canadian Tire Motorsports Park this Sunday, July 13 at 2:00 p.m. EDT on FOX Sports 1. PAIR OF PODIUMS: SRT Motorsports finished second (91) and third (93) in the Sahlen’s Six Hours of The Glen at New York’s Watkins Glen International on Sunday, June 29, marking the team’s third and fourth podium results of the season. If not for a late-race caution, the No. 91 Viper driven by Dominik Farnbacher and Marc Goossens would have likely won the event utilizing fuel strategy. Through five races, all four Viper podiums have come in endurance events and SRT Motorsports is the only team to finish on the podium in all three endurance contests in 2014. DUELING TO THE FINISH: The dual podium finish by SRT Motorsports at Watkins Glen was the second time the team had achieved the feat. Prior to The Glen result, SRT Motorsports finished second (91) and third (93) at Canadian Tire Motorsports Park (Mosport) in 2013 for the team’s first double podium. The 2013 Mosport race weekend marked the start to a surge in SRT’s performance that saw the team tally their first win (Road America), two poles (Mosport and Road America) and six top-five results over a four-race span that year. CANADIAN CONFIDENCE: SRT driver Kuno Wittmer is from Montreal and is so familiar with Canadian Tire Motorsports Park that he can tell you where to camp for the race. Wittmer has logged thousands of laps on the track with multiple championships and has camped at the track during a few of his own race weekends. He scored his first-ever podium at the track when he was 16 years old and went on to win numerous events at the track as he advanced his racing career. SNAKES SHED SKIN: SRT Motorsports returned to the Dodge Viper’s classic livery during the Watkins Glen International race weekend in an effort to honor the Viper’s racing heritage. Sporting ‘Viper Red’ and ‘Race White,’ the team recorded a dual podium finish in the same livery worn by Dodge Viper entries that took the overall victory in the Rolex 24 At Daytona in 2000, a GTS class win in the 2000 24 Hours of Le Mans, and American Le Mans Series (ALMS) championships in 1999 and 2000. The team will continue to utilize the classic livery throughout the 2014 season. SRT POINTS PRIMER: After five of 11 races for the IMSA TUDOR GTLM class, the Viper SRT GTS-Rs rank third (91) and sixth (93) in the team standings with 140 and 137 points, respectively. Farnbacher and Goossens are third in the driver standings with 140 points, while Jonathan Bomarito and Wittmer sit in fifth with 137 points. In the manufacturer standings, SRT ranks fourth with 148 points, 11 marks behind first place. How competitive is the GTLM class right now? What do you need to have success at Mosport? Does the Watkins Glen result give the team added confidence moving forward? How do you feel entering the Mosport race weekend? Do you enjoy racing at Mosport?